You need the best masticating juicer, right? Well, you are not alone and the process can be daunting especially with the vast number of models currently in the market. But finding the best model is vital to enjoying fresh, delicious, nutritious and healthy juice from your favorite fruits and vegetables. We have spent an unimaginable amount of time researching and comparing the many different models of masticating juicers. Therefore, we feel uniquely qualified to help you make an informed choice. The modern type of juicer produces a high quality juice. Unlike centrifugal juicers that tend to warm fruits and vegetables, the masticating juicers will not deliver oxidized or cooked flavor. The excellent results come from the fact that the latter type of juicers uses a new, improved extraction technology. Based on the Results of our Research, Here are Our Top 10 Best Masticating Juicers. We consider the Omega J8006 the best slow masticating juicer currently in the market. It is a dual-stage slow speed juicer that delivers continuous, fresh vegetables and fruit juice extracted at just 80 revolutions per minute. Despite the slow speed, the yield is pretty high. Furthermore, the slow speed results in low heat buildup and oxidation. The outcome is juice that retains the natural enzymes you need for a healthy life. The juicer is engineered to extract optimal amounts of nutrients, taste and vitamins from a minimal amount of fruits and vegetables. It can extract high quality juice not only from fruits but also from wheatgrass and leafy greens. The Omega J8006 Nutrition Center is so versatile. Besides extracting juice, you can use it to turn nut into butter, grind spices and coffee, extrude pasta, mince garlic and herbs and whip up soy milk in no time. Parents with young children will love the fact that the juicer can make baby food and frozen desserts. The juicer produces the high yield with dehydrated pulp. This means maximum extraction. Once the extraction is complete, the machine is designed to eject the pulp automatically. This allows for continuous juicing. For stability during operation, the juicer is fitted with four steady feet. It is one of the quietest masticating juicers currently in the market. Aicok Slow Masticating Juice extractor is the way to go if you are looking for a multi-purpose juicer. You can use it to extract various types of fruits and vegetables in just a few minutes. You can be sure of less pulp in juice with more abundant nutrients. 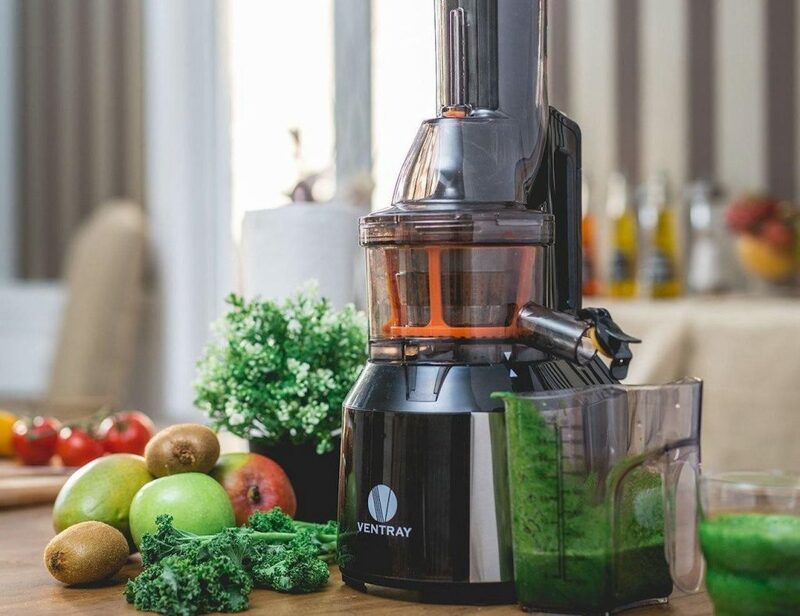 The auger of this juicer spins at 80 revolutions per minute to preserve the healthy enzymes, vitamins, minerals and trace minerals. The slow operation also prevents oxidation, results in low heat build-up, no clogging and minimal foaming. The juicer perfectly separates juice from pulp to produce higher purity juice that preserves a higher nutritional value. The yield itself is 60% to 80% higher than that of the centrifugal juice extractor. 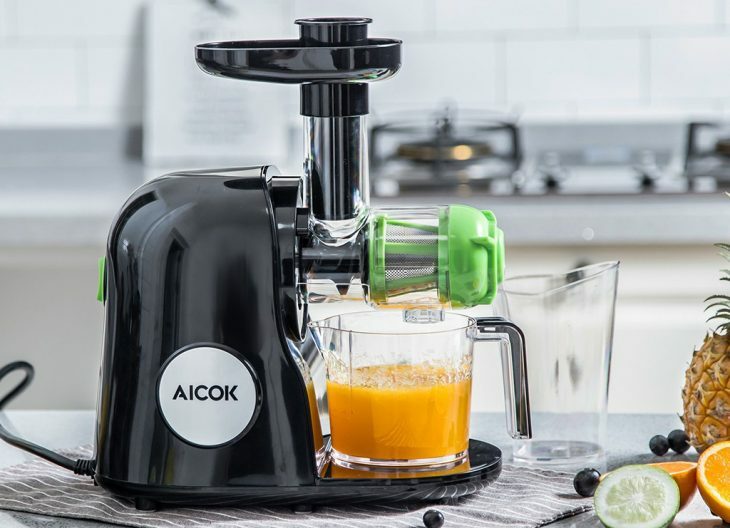 The Aicok Juicer operates conveniently and silently. It runs at just 60 decibels. This is great if you do not wish to disturb the peace of others living in the house. The juicer comes in parts you need to assemble. You do not have to worry about this since the unit is very easy to assemble. It is also very easy to operate. All its parts are dishwasher safe meaning cleaning is a breeze. This product is strong and durable. 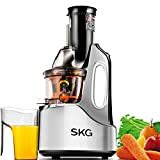 It features heavy-duty construction and stable body that will be easy on your kitchen countertop when you are making juice. Stability is guaranteed by the juicer’s six solid feet. The Breville BJE430SIL masticating juice extractor is one of the few brands that present 3-function switch. The triple function allows you to set the gadget to operate either at fast or slow speeds. The third function is the power switch that will enable you to turn the juicer on and off. The low speed operates at 6500 revolutions per minute while the high speed setting spins at 13000 revolutions per minute. Despite the high speed and low-speed capabilities, the juice extractor still functions quietly. It is fitted with an efficient and powerful (850-watt) motor that generates the high-speeds necessary for the toughest vegetables and fruits in a very short. Are you wondering what the word “COLD” in the name of the juicer represents? Well, it refers to the rather insignificant heat transfer when you compare it with other brands that use the same technology and term. Do not confuse it to mean the juice extracted is chilled via a chilling mechanism featured in the device. The BJE430SIL features an extra-wide chute measuring 3 inches (or 7.6cms). This maximizes feeding efficiency and reduces the preparation time. The large chute is intentional as it allows you to feed whole fruits and vegetables without having to pre-cut them. The unit comes with a seal and store 70-ounce (2 litres) juice jug. Simply make juice and it will pour automatically into the jug. You can then seal and store juicer for later servings. SKG is well-known because of the quality of products they make. This slow masticating juicer is incredible in design and functionality. In comparison to the juice extracted by a centrifugal juicer, the SKG Wide Chute anti-oxidation masticating juicer produces much more nutritious, fresher and tastier juice. Due to low oxidation and minimal heat transfer, the yielded juice last longer. The unit is fitted with a top quality 240-Watt AC motor with low speeds of just 60 revolutions per minute. It squeezes fruits and vegetables with minimal oxidation. This preserves the natural taste of the ingredients as well as their nutrients. It can extract juice from carrots, oranges, apple, pear and celery leaving behind a dry pulp. The yield from these fruits ranges from 47 percent for carrots to 90 percent for oranges. To make your work easier and to spare you some preparation time, the juicer features a large 3-inch chute. The chute can accept even large fruits. The less chopping reduces oxidation because larger produce items are harder to oxidize. It is also resistant to clogging and foaming. This makes the juicer easy to use, clean and maintain. The juicer features a sturdy handle for effortless portability and cleaning. All parts of this juice extractor are made of high quality TRITAN food-grade materials. The materials used are stainless steel and silicon. This juicer is indeed the champion of masticating juicers. It features a rare design that sets it apart from its competition. But the uniqueness does not end in design; it is also in the functionality. 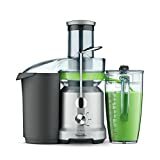 The juicer may not be as affordable as some of the ones we have reviewed here, but that’s what you must expect from a high quality material. The body of the Champion is constructed from a strong and durable nylon. Unlike the models made from plastic, this unique can take a lot of beating before it shows any signs of wear and tear. This is because nylon will flex instead of breaking or cracking. Because of the heavy-duty nylon construction, Champion is a little bit weightier than other models. It weighs 25 pounds. This is not necessarily a drawback because it adds to the durability and performance of the juicer. The weight also ensures stability during operation. Although the champion is a masticating juicer, it spins at a fast speed of 1725 revolutions per minute. Such speeds are associated with vertical or centrifugal juicers which are better in extracting juice from softer fruits and vegetables and not harder ones like kales and wheatgrass. The faster spinning speeds also mean you will contend with some noise. The GSE-5010 is the ultimate masticating juicer for anyone looking for the best slow masticating juicer. It features bio-ceramic magnetic twin gears made of high-grade stainless steel. The gears are responsible for the freshest, most excellent quality juices of any cold-press juice extractor. This technology preserves living enzymes as well as vitamins and thus preventing nutrient degradation for extended shelf-life. To ensure minimal oxidation, the juicer extracts juice from fruits and vegetables at spinning speeds of 110 revolutions per minute. This way, it can obtain juice from almost all your favorite fruits and vegetables. The result is superior juice quality including great taste and high yield. Everyone needs a machine that is easy to clean and maintain. The Greenstar Elite masticating juicer is simple and easy to assemble. This is because it features fewer parts in a modern, elegant design to match your kitchen decor. To make cleaning even easier, the product comes with cleaning brushes and a one-of-a-kind scrapper tool. The most beautiful feature of the Greenstar Elite is its versatility. The package includes homogenizing accessories that allow you to turn it into a food processing and a homogenizing tool. These capabilities mean you can create frozen sorbents, salsas and kinds of butter. You can even make your very own pasta noodles with Greenstar Elite’s optional pasta nozzles. If you are operating on a tight budget yet you’d like to buy a good quality masticating juicer, then SimpleTaste Electric juicer would be a great option. 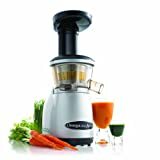 This high-yield juicer uses slow speed, high power 80rpm motor that preserves and maintains healthy nutrients and enzymes. The slow-speed extraction also prevents oxidation from giving the juice better taste and a longer shelf-life. This also means insignificant heat buildup during the extraction process. You can store the juice for up to 72 hours yet it will still look and taste fresh. You cannot say the same of centrifugal juice extractors. This product is multi-functional. Use it to make fresh juice from fibrous vegetables such as ginger and celery, wheatgrass, leafy greens as well as barley grass. Also, make nutritious juice from all varieties of fruits. You do not need to be startled because this masticating juicer is very simple to assemble, operate and disassemble. Just press the control button to extract the optimal amount of juice from your fruits and vegetables leaving behind dry pulp. It operates very quietly for your convenience. The tool uses a reverse function in order to prevent clogging. The parts of this masticating juicer are completely detachable without the need for any tools. This makes cleaning of the tool very easy. Even better, a cleaning brush is included to help you with hygiene. The package comes with juice and residue containers. NutriHome offers you a great way to enjoy fresher and more nutritious juice from your favorite fruits and vegetables by buying and utilizing their high efficiency juicer. With the machine, you can extract as much as 30 percent more minerals and vitamins and 20 percent more juice than most other masticating juicers currently in the market. 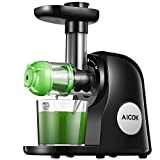 This versatile and multi-purpose juicer can extract the large amount of juice from fibrous vegetables (celery and ginger), barley grass, wheatgrass as well as other leafy greens. You can get juice from literally all fruits including apples and oranges. Its extraction efficiency is seen in the dry-pulp that ejects automatically for a continuous function. The auger of this juicer spins at speeds of 80 revolutions per minute. This means insignificant heat buildup and low oxidation. The result is fresher, tastier juices with longer shelf-lives. The slow-speed motor preserves the healthy vitamins, minerals, enzymes, trace minerals as well as other nutrients for more a healthier lifestyle. Slow operation and reverse function ensure minimal foaming or clogging. The functionality ensures the resultant yield is high and great quality. You will enjoy a very delicious, flavorful, rich and concentrated juice for your favorite fruits and vegetables. You will also love the convenience of this masticating juicer. It is very easy to assemble, clean and operate. All of its parts are dishwasher safe. This makes cleaning the juicer a breeze. Besides being easy to operate, the machine is very quiet. It is fitted with a unique decelerating gear within the motor to minimize noise and vibration. Argus Le is in the business of making your life healthier and more comfortable thanks to their great products. 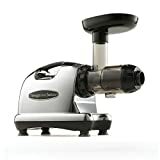 Their masticating juicer is nicely built and intentionally designed to make the work of juicing easier. 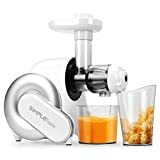 This multipurpose juicer features a patented squeezing auger designed to cut, squeeze and extract juice from assorted vegetables and all fruits. It features a uniquely elegant design that will complement your kitchen decor. The sleek design is not only great to behold, it also makes the machine very easy to disassemble, assemble and clean. The whole process will only take you 4 minutes. If you own this machine, you have no excuse for not including a healthy and nutritious fruit or vegetable juice in your daily meals. This juice extractor is fitted with a quiet and more durable motor. It runs at less than 60 decibels which is barely audible. This noise is much less than what you’d expect with the traditional centrifugal types of juicers. Even more interesting is Argus Le’s peculiar Delayed Start technology that helps to protect the unit’s motor from inappropriate use. Its high torque motor is fitted with an overheat protection technology with assures durability and performance. The extractor is multifunctional. It can extract juice from various fruits and vegetables including the harder ones such as carrots, celery, kale, wheatgrass, and leafy greens. You can actually make juice from literally all fruits. 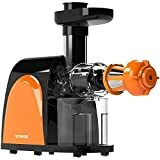 Although the Omega VRT350 occupies the 10th position in our top 10 best masticating juicer reviews, it is not inferior to the others in the list. The only reason why it occupies this position is its price which is a little bit higher than the average price of the ones we have reviewed. Like most other low speed masticating juicers, this model is fitted with 80 revolutions per minute motor. The motor is so powerful yet it delivers high quality juice with optimal yield. The slow spin speed also means less oxidation and insignificant heat buildup. The result is fresher, healthier, tastier and more prosperous juice. The Omega VRT350 juicer features some great technologies that boost its performance. The first of these technologies is automatic pulp ejection. The technology allows you to make your favorites juicers continuously because it eliminates the need to stop and remove the pulp. This will not only make your work easier but also reduce the time you’d spend on the task. The technology also makes clean-up very easy. The other great technology worth mentioning is the triple (ON/OFF/Reverse) function. The aim is to make the machine very easy to operate. The reverse function works to assist in the releasing of pulp to prevent clogging. An oversize spout provides for easy and quick serving while its small, vertical footprint takes up little space in your kitchen-countertop. We do not doubt that our list has some of the greatest masticating juicers currently in the market especially if you are operating on a tight budget. We are confident that you will find a suitable masticating juicer for your needs. However, it is also obvious that our readers have different tastes and preferences. When shopping for a masticating juicer, one key element to look out for is the type of auger or gear it is fitted with. In this case, you have to choose between single and double auger model. The models featuring single gears are cheaper than those fitted with double gears. They are also not as durable. They can serve you for a little longer than two years. In terms of performance, a single gear slow juicer can still extract juice from wheatgrass, barley grass, leafy grass and pineapples. However, you must not overdo it as it cannot hold-up under heavy use. The double auger models are much better. They will churn through all types of fruits and vegetables without a problem. This is because such juicers feature two gears that grind against one another. The result is high-yield more extended service. Regardless of whether you have chosen to buy a single or a double-auger masticating juicer, your next concern should be the power and speed of the machine. All masticating juicers operate at low speeds in order to reduce oxidation and heat build-up. However, the degree of heat buildup and anti-oxidation varies with each model. Generally, go for masticating juicers that have speeds of not more than 100 revolutions per minute. The lower the speed the better the yield you can expect. Even better, go for models that have dual speed settings. The low speed is great for extracting leafy vegetables while the high speed extraction is suitable for fresh vegetables and fruits. No matter how great a masticating juicer is, it would be useless if you cannot operate it with ease. Therefore, great brands have tried to make operating their slow juicers as easy as possible. Look for models that are actually easy to operate. Look for features like wide chute to allow for easy feeding of products. A large chute will eliminate the need to cut the fruits into smaller parts before you feed them into the juicer. This will cut you the preparation time and produce higher yields. While a large juicer may work faster, they can be too heavy for you to handle easily. Such may also occupy a very large pace in your kitchen countertop. For domestic use, a smaller and more compact model would suffice. Find one you can dismantle and reassemble easily. You should also be able to move it around and store it without a hassle. Also, ensure it has controls that are easy operating. Unlike the traditional centrifugal juicers types that feature various parts that come off easily, masticating juicer parts are often interlocked. This does not mean you’ll need tools to disassemble them. Many models feature parts that you can detach from each other with minimal effort. Buying an easy to disassemble models is directly proportional to ease of maintenance. If easy to disassemble then it is easy to clean and service. Do not do the mistake of planning to buy something without considering its cost. What you buy is what you get. A cheap model definitely lacks most of the features that guarantee the efficiency of performance and productivity. This does not mean you cannot find an affordable masticating juicer. Carry out adequate research by comparing prices and features. Most importantly, make a purchase based on your budget. Q 1: What is a masticating juicer? A masticating juicer is a single/double gear extractor that users auger to extract juice from fruits and vegetables inserted into it at slow speeds. The speeds vary but are generally between 80 and 100 revolutions per minutes. Most models crush and then squeeze products to extract their juices. Q 2: What are the best masticating juicers? The word best can only be defined in terms of an individual’s taste and preferences. However, certain features are a must for a high quality masticating juicer. The best masticating juicers should have a powerful low speed motor, good controls, good pulp management and features of convenience. It should be high yielding yet still affordable despite excellent performance. Q 3. Which is the best masticating juicer? Based on our research and experience, the Omega J8006 Nutrition Center Quiet Dual-Stage Slow Speed Masticating Juicer is the best you can find in the market. You can check it out. It has some of the best features yet it will not hurt your savings. The best features are automatic pulp ejection, reverse function, dual-stage motor, quiet operation and ease of operation among others. Q 4. What is the difference between a masticating juicer and a centrifugal juicer? The difference lies in the extraction process. Masticating juicers have slow speed motors that crush and then squeeze fruits and vegetables to extract juices. The slow speed reduces heat build-up and minimizes oxidation. This is great because it preserves the vitamins, enzymes and nutrients. The result is more delicious, fresher and tastier juice. The slow juicers are quieter and produce higher yields. The centrifugal models use centrifugal force to spin pulp in its chamber to extract juice. The centrifugal force pushes the cut pieces of pulp against a mesh strainer what extracts the fluid. Thus it works faster but less efficiently. The yield is lower and less fresh compared to that produced by a masticating juicer. Q 5. Where can I buy the best masticating juicer? If you want to enjoy the most competitive prices, limitless varieties to choose from and the convenience of being delivered right at your doorstep then buy your favorite juicer from an online store. Amazon is doubtlessly the best online shop for masticating juicers. You will enjoy amazing discounts, variety, great customer service and fast delivery. Hopefully, you have found what you’ve been looking for. Armed with this information, nothing should stop you from buying the best masticating juicer currently in the market. Choose the easy way of simply clicking the link provided to find out more about each of the masticating juicers in our list. Otherwise, use the guide we provided you with this review to make an individual choice. You should not find it difficult to arrive at the best decision. It is high time you updated your kitchen and improved your health by introducing a high quality masticating juicer. You will not regret making this important decision. familycookware.com is a participant in the Amazon Services LLC Associates Program, an affiliate advertising program designed to provide a means for sites to earn advertising fees by advertising and linking to Amazon.com. Amazon, the Amazon logo, AmazonSupply, and the AmazonSupply logo are trademarks of Amazon.com, Inc. or its affiliates.